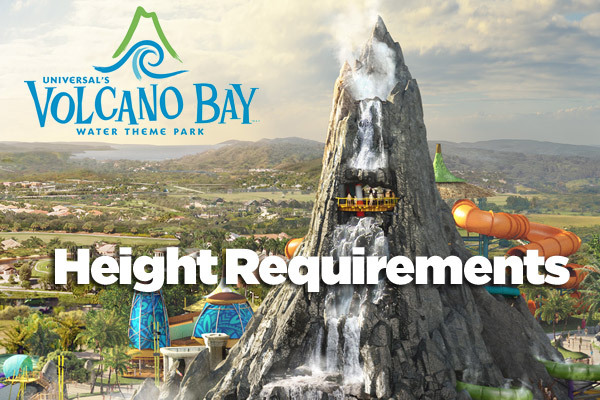 Height requirements for Universal’s Volcano Bay at Universal Orlando Resort are listed below, but for the quick answer; if you are over four feet tall, you will be able to do all the rides and attractions at Volcano Bay, aside from the kiddie areas, where you’ll need to be below four feet tall. For your kids, this water park is awesome because there are only a few rides where you need to be at least 48” to ride; that’s the tallest height restriction at Volcano Bay. Many of the rides and water slides, you need to be between 42” and 48” with a supervising companion. This is great when you go to Volcano Bay with family or friends because on these rides you’ll get to share the fun together, which makes it all the better. o Children under 48” (121.92 cm) must wear U.S. Coast Guard Approved flotation device. · Teawa The Fealess River™: Must be at Least- 42” (106.68 cm) - Guests 42” to 48” (106.68 cm - 121.92 cm) must have a supervising companion. o Children under 48" (121.92 cm) must wear U.S. Coast Guard approved flotation device.